1. Long Lasting, Superior UV Protection: Provides superior photo stable protection against broad spectrum UVA and UVB. 2. UV Anti-Aging Protection: Contains 2 anti-aging ingredients, RonaCare Ectoin and Antileukine 6, which help to prevent pigmentation and wrinkles from surface to deep within. 3. Intense Hydration (Dryness Protection): Contains Super Hyaluronic Acid, Collagin and Pro-Vitamin B. 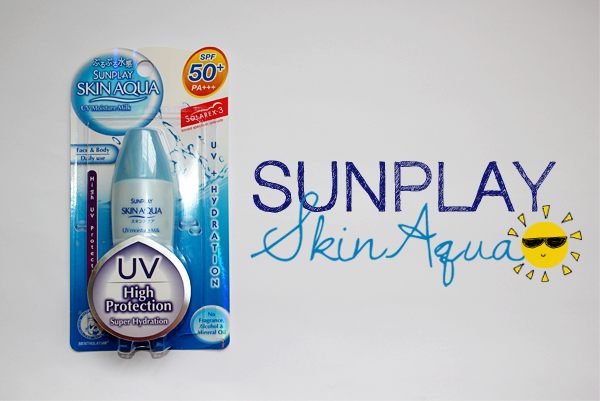 With a SPF 50 PA+++, this sunscreen is going to shield you for long hours under the sun. And it doesn't just stop here! The sunscreen also contains Super Hyaluronic Acid, Collagen and Pro Vitamin B. Super Hyaluronic Acid will keep our skin hydrated, soft and supple, while the other 2 will improve our skin's elasticity and reduce fine lines. The sunscreen is waterproof, sweat-proof, contains no colorants and can be used as a makeup base. After applying my moisturizer, I apply a thin layer of the sunscreen on my face. Do remember to give the bottle a good shake first! At the end of the day, I remove it with Bioderma's Créaline H2O. Having tried Sunplay's products before and liking them (Click here to read! ), I was looking forward to trying this new one. And Sunplay didn't disappoint! Lightweight and watery, this sinks into the skin easily and feels very comfortable. I like that it's moisturizing, though I don't suggest you skip the moisturizer before applying this. There is no greasy-feeling and no white cast. It leaves my skin feeling smooth and semi-matte, aiding the application of my foundation. I haven't encountered any irritation with this but do note that this contains silicones. 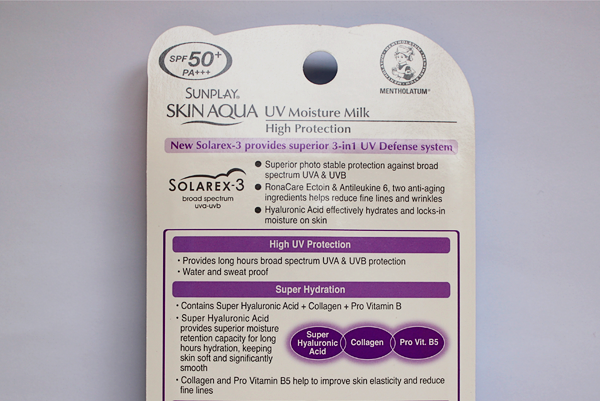 Sunplay's Skin Aqua UV Moisture Milk is a fuss-free suncreen. Besides protecting you from harmful rays, it also hydrates your skin and keep wrinkles at bay. This will make a perfect companion for those who are looking for some simple and easy protection from the sun. (: It can be found in Watsons, Guardian, Sasa, Unity and other major department stores.